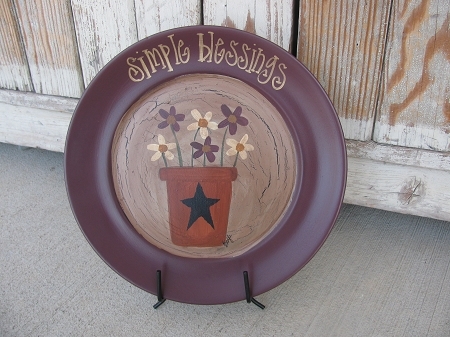 Primitive Country Daisies in Flower Pot Hand Painted Plate. Primitive terra cot flower pot filled with burgundy and cream colored daisy wild flowers. You could match this one up with any of our summer plates for a set or set of three. 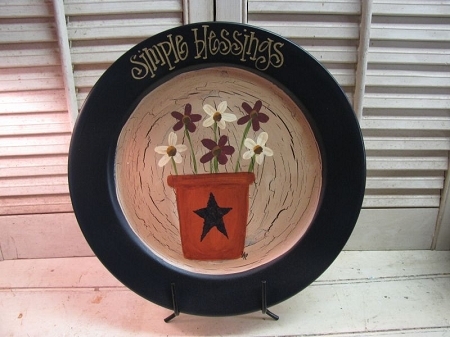 This one has been painted with the burgundy rim color, see other image for plate in Dark Navy Blue. You can choose your favorite saying and rim color from the options listed. I recycle/reuse stoneware dinner plates, so average size is around 10"-11". This plate will be perfect with your spring/summer decor. Hand painted, designed and signed by Heidi.